Ensemble Civil (EC) is a string orchestra composed of 14 civil engineers who are the member of Japan Society of Civil Engineers (JSCE). EC was formed in December 1993 for the performance in the JSCE’s 80th anniversary ceremony in 1994. EC plays on JSCE’s general and annual meetings, and other events related to civil engineering. EC played at the JSCE’s 100th anniversary ceremony in 2014. In 1995 EC was invited by the Institution of Civil Engineers and performed in London. 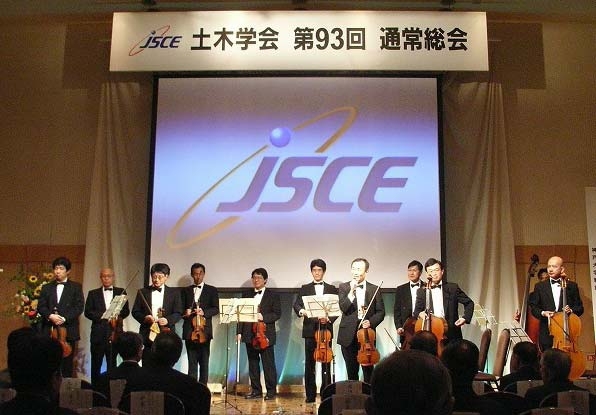 In 2008 the quartet of the EC’s chief players was invited by Korean Society of Civil Engineers and performed in the KSCE’s national convention. EC also actively interacts with public who love music and had domestic concerts in Okinawa, Yamanashi, Fukuoka, and so on. Our motto is being a top-notch civil engineer and a top-notch musician at the same time. As an engineer in civil engineering, the member plays an active role in the front line, while he plays a leading role in a local amateur orchestra. The members are scattered throughout the country, and their workplaces are different each other. The only chance that they practice all together is the training camp in Yamanashi Prefecture twice a year and the concert performance day. However, the members are connected by a common thread called civil engineers and can quickly make a harmony under the concert master when they meet. It seems that civil engineering and ensemble do not look similar. But in terms of being able to make good things by recognizing their own roles and matching the forces together, we think they have many things in common. EC would like to deliver a breath-matching harmony like civil engineers to the performance. In October 2017 at Yangon Technological University, EC had its first performance in Myanmar.